We’re delighted to announce the winner of the ASE Book of the Year Award 2018 goes to The DNA Detectives - To Catch a Thief by Dr Amanda Hartley, a story written for young people to introduce them to the world of forensic science and how scientists work in laboratories. You can purchase a copy of Amanda’s books and the other shortlisted titles in the ASE Bookshop. In an interview with the author, we had the opportunity to ask a few questions about what drove the ideas behind the book. What inspires you as an author and led to you writing the DNA Detective series? I have had such a wonderful career working with DNA and this inspired me to want to share this with children. I run workshops teaching children as young as four years old about DNA in Cambridgeshire, Norfolk and Suffolk. I also perform stories to help pupils understand difficult science subjects such as evolution, natural selection and inheritance. I am limited however, in how many children I can reach. When a friend suggest that I write a book I realised I could use this to reach children all around the world and share my passion for science and literacy with them. If I can inspire our next generation of scientists using my books then my work is done! How do you think your books might be used in schools to support science learning? I purposely wrote my books so they could be used as a cross-curricular tool for teaching literacy and science. I kept the chapters short and easy to read and ended each chapter on a cliff hanger. The idea was that the exciting story and science content would appeal to even the most reluctant of readers and they would be learning without even realising! I knew children would love the idea of being forensic scientists and solving a crime. 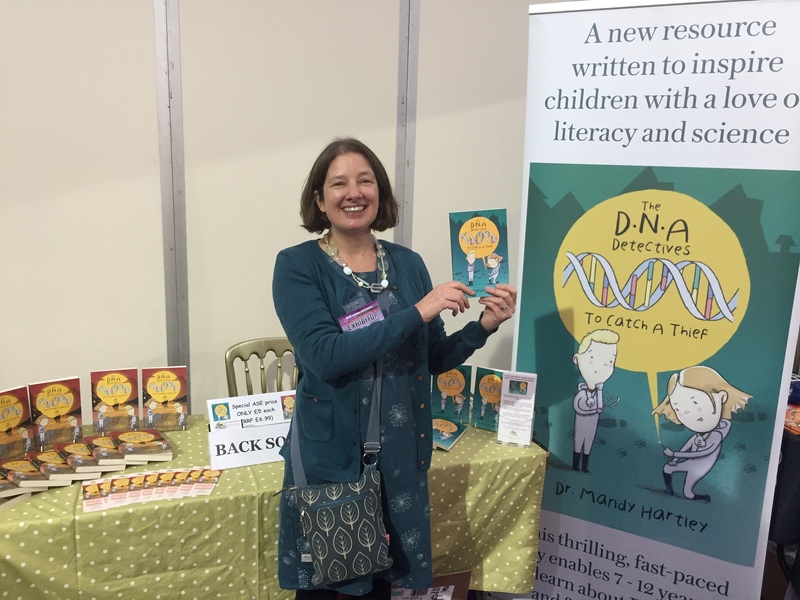 Both books "The DNA Detectives - To Catch a Thief" and "The DNA Detectives - The Smuggler's Daughter" are packed with links to the curriculum for KS1, KS2 and KS3 science and literacy. They help children understand DNA, inheritance, cells, chromosomes and genes and were written to help with teaching "Evolution and Inheritance". There are also links to "living things" and "magnets and electricity". The books introduce children to forensic science and how scientists work in laboratories. At one point the children break into their mother's lab and extract DNA. They have to work methodically and then use the data to try and work out who the pet thief is. Children will love trying to work out who they think the pet thief is and discussing the evidence to support their arguments. It has been really exciting to see how schools are using the books either as a class text or for individual reading. Some have used the book as a hook for science week. They created a crime such as the school cup being stolen and the children had to interview the staff and collect and analyse evidence to find out the identity of the thief! Other schools have written poems about DNA. When I found out that year 2 pupils had been using the word "Deoxyribonucleic Acid" in their poems my heart swelled with pride! Other schools have created fantastic lost dog posters, newspaper articles, set up crimes scenes, made DNA bracelets to support their learning for classification, acted out sections from the book and even drew a DNA helix on the playground in chalk! The feedback I get from schools who have worked with the book is there is a real buzz about science, finding out about careers in science and children wanting to find out more. Even the most reluctant readers can't wait for the next chapter to be read. It makes me so happy and was the reason why I wrote the books. I can't wait to start the third book which will combine the Stone Age with science and literacy! What does the ASE Book Award signify for you as an author? Winning the ASE Book Award is a dream come true for me. When my name was announced my eyes filled with tears. I was told at school that I wasn't very good at English and could I try and write more like my friend. I think it goes to show you that things can change and that dreams can come true! It also signifies to me that the ASE can see what I was trying to achieve with these books in terms of their education value and reaching children and inspiring them with a love of science and literacy. I am so grateful for this opportunity. Submissions for the next award will open in April 2019. There is a series of activities linked to the books for children including solving crimes with online forensic games, fingerprinting, making plaster casts of footprints or extracting DNA from fruit in the classroom.